Australia will see the return of hip hop heavyweight Xzibit in November. Xzibit marks his return to Australia after almost five years with a whirlwind tour that sees him cover 11 venues in a just over a fortnight. Alongside capital cities, X will grace Newcastle, Cairns, Townsville, Traralgon and Hobart for the first time ever. Saturday October 4 is festival day, and it is a riot of activity at Grazzhopper HQ in the leadup. Everyone is working round the clock to make Grazzhopper 08 a killer event. Xzibit is the headline act and he wont disappoint! THE BIGGEST EVER MUSICAL EVENT TO HAPPEN IN THE GEELONG REGION, GRAZZHOPPER FESTIVAL IS A MUST SEE FOR LOVERS OF ROCK, HIP HOP & DANCE MUSIC. A LICENSED, ALL-AGES ALL-DAY AFFAIR, HELD OVER THREE STAGES, INCLUDING AN ENORMOUS BIG TOP MARQUEE, THE FESTIVAL IS GOING TO BE MASSIVE. FIRST ROUND TICKETS HAVE SOLD OUT, SECOND ROUND TICKETS HAVE SOLD OUT – BUT THERE ARE STILL SOME THIRD ROUND TICKETS LEFT IF YOU’RE QUICK. 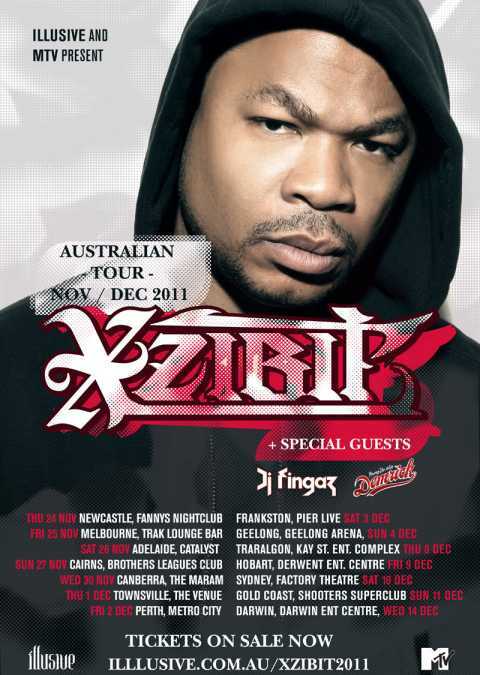 On Air Entertainment is pleased to announce the return of hip hop superstar Xzibit to Sydney in early October 2008. After headlining the Grasshopper festival in Geelong, Xzibit will perform 1 exclusive show at the Forum in Sydney on October 5th before returning to the states. Xzibit will take the stage in Sydney for an exclusive Australian performance and the intimate setting of the Forum is sure to make this show one not to be missed. As I am based in Australia, I hope to be able to get in touch with Xzibit while he is out here to see what he has planned for the near future. Keep an eye on XzibitCentral.com for more first hand information! Xzibit will take time out from MTV’s “Pimp My Ride” to work the stage during a month long world-wide tour. The west coast rap icon launches the Back II Basics World Tour on May 5 in Brussels, and wraps things up June 26 in Adelaide. The itinerary is included below. Xzibit will be rocking the mic to promote his 6th solo album, Full Circle, released in October 2006. To kick off the Back II Basics tour Xzibit will take part in the Gumball 3000 Rally – a 5000km (3000mile) car rally that winds its way throughout Europe. In a recent interview Xzibit show how keen he is to get the tour started. The rapper has found a broader audience since landing his role on MTV’s “Pimp My Ride,” which films custom auto makeovers awarded to random winners. He recently recorded an episode of Pimp My Ride with California Governor Arnold Schwarzenegger on an Earth Day special to promote the importance of global warming. Japan tour dates are yet to be announced. My grandson is in recovery and his ride needs some major repairs he can’t afford. I can’t afford them either and would like to have you guys come in and take this over and fix his car. He has almost finished a year long program and is trying to get his life back on track right now he is driving my old GMC Yukon that I gave to his sister. Please help him so he has a ride that is dependable and looks great.